Embryological differentiation of the foot is noticeable by the fifth intrauterine week. By the end of the fifth week, condensation of the mesenchymal tissue has resulted in the formation of tarsal bone anlage (earliest developmental models). Tissue differentiation to precartilage and cartilage follows and all skeletal elements of the foot have begun to chondrify by 7 weeks with the exception of the distal phalanx of the little toe. By the end of the second month, the outline of each bone is becoming distinct [1–3]. Homogenous interzones develop at the ankle and between all tarsal, tarsal-metatarsal, metatarsal-phalangeal, and interphalangeal joints with the three-layered interzone developing earliest at the ankle and metatarsal-phalangeal joints at the end of the embryonic period (8 weeks). Cavitation with vascularized synovial tissue is seen in most joints of the foot at 9–11 weeks (early fetal period). A proximodistal sequence of development unfolds. By the end of the embryonic period (8 weeks), the foot resembles that of the adult in most details. All elements of the foot destined to become bone have begun to chondrify (except the distal phalanx of the little toe) by 7 weeks of embryonic life. Anomalies of the skeletal elements (such as tarsal coalition) form very early. 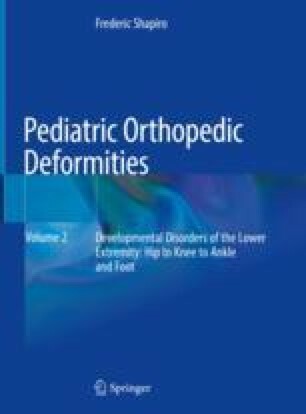 The articular surfaces of the ankle joint and of the other joints of the foot reach a high degree of differentiation before the resorption phase of the interzone begins around 8 weeks of age. Hesser noted that the articular surfaces of the ankle joint reach a high degree of differentiation even before joint cavitation is complete . The talonavicular and calcaneocuboid joints also reach close to their final shapes very early. Straus also stated that the joints of the foot are laid down in their definitive form by the ninth intrauterine week . Cavitation of the interzone to form the synovial joints begins first at the ankle and progresses distally, forming last in the interphalangeal joints. O’Rahilly et al. further reviewed the skeletal development of the foot . The prenatal development of the human foot has been well studied and described by Gardner et al. who reviewed the extensive developmental literature as well as assessing 184 human embryos and fetuses.